Some people will question the ethics of baiting sharks. I won't. The sharks are not fed properly. They are attracted by the bait and therefore lured to come closer to the divers. Getting close to a shark in the wild is very difficult and almost impossible if no bait is used. The fact that these dives happen without mishap show that the sharks don't associate humans with food. 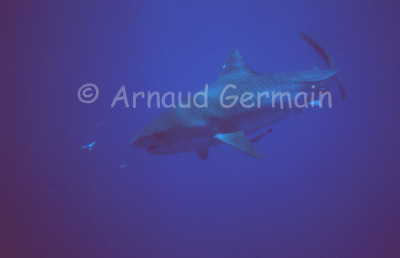 The female tiger shark on the picture is about 4m long. If she wanted to eat a diver in the water, there is nothing that diver could do to stop her. The fact is, she is not even trying!